Neemat Frem shares insights into the Lebanese industrial sector. 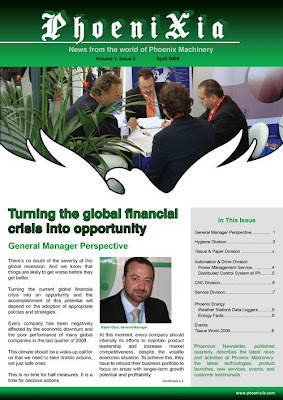 Al-Iktissad Wal Aamal, a monthly magazine devoted to industry in the Middle East, featured INDEVCO Group's President and CEO in its April 2009 issue. In the article "Economic Lobby Required" in the Young Leaders section, Frem discusses major trends and concerns which affect the industrial sector in Lebanon and proposes solutions. Frem also emphasizes the importance of human capital to the Lebanese economy. Regarding the global economic crisis, Frem states that Lebanon survived this crisis; however, we should not rest on our laurels. MASTERPAK wins bid for agricultural films over international manufacturers from Europe and the Middle East. MASTERPAK, Lebanese manufacturer of polyethylene agricultural films, has been awarded a bid to supply Ethio Agri-CEFT PLC with high quality agricultural films. Based in Addis Ababa, Ethiopia and a member of MIDROC Group Companies, Ethio Agri-CEFT operates two farms that produce coffee and tea. 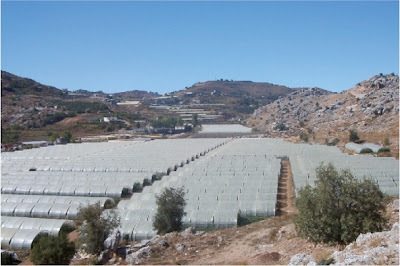 MASTERPAK will supply 3-season thermal greenhouse covers with anti-fog for multi spans in Baher Dar, Ethiopia. 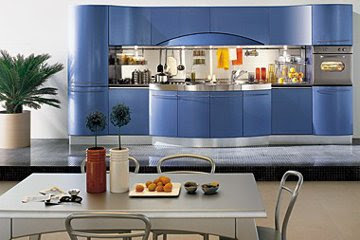 The technical committee selected MASTERPAK, based on high quality and competitive price. “We're delighted to introduce 3-season covers in Baher Dar, Ethiopia. Our films will offer added value to growers for a longer period. 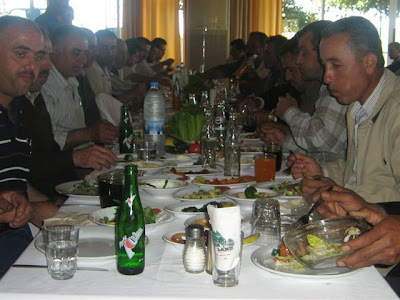 ", said Jihad Rahme, MASTERPAK Export Sales Manager. 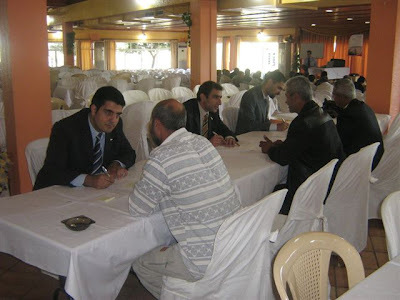 Baher Dar, located 900 kilometers from Addis Ababa, has promising cultivation conditions. Further, the local government is developing the agricultural industry through such infrastructure improvements as water, roads, power, land rental, and logistics systems. Parties interested in MASTERPAK's agricultural and horticultural films may request quotes and samples online for greenhouse covers, ground cover film, hale bale plastic, hydroponic gully film, low tunnel film, mulch film, protective bags for banana cultivation, silage film, soil disinfection film and water membrane. Established in 1979 in Lebanon, MASTERPAK sal co-extrudes and cuts PE films and flexible packaging products for the agricultural, construction, consumer, food and beverage, and industrial sectors. Products are destined for Europe, Africa, the Middle East, and beyond. 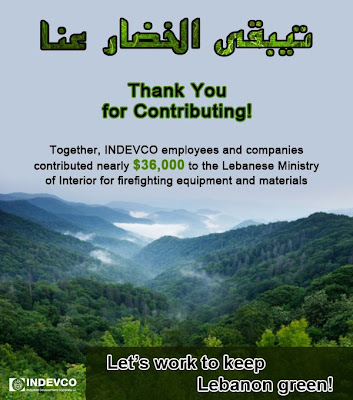 Neemat Frem thanks INDEVCO and Napco companies and employees for donating nearly $36,000 to 'Ta Yebka El Khadar Enna' campaign; the funds will be used to purchase firefighting equipment and materials in Lebanon. 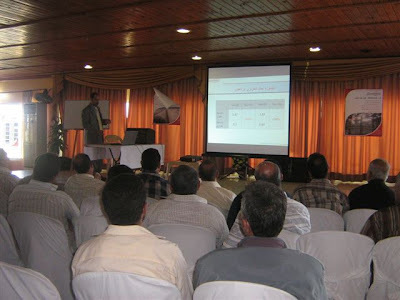 Launched in January 2009, the campaign generated nearly $24,000 USD from the group's manufacturing plants and companies in Lebanon and $12,000 USD from Napco plants in Saudi Arabia. Donations will support the Lebanese Ministry of Interior's initiative to upgrade the Civil Defense (Difaa El Madani) Fire Department with new equipment and materials. Translated roughly as ‘So the Green Remains’, the fundraising campaign sought, first, to collect 10,000LL (approximately $6.65) or more from each employee who would like to participate and, second, for each INDEVCO affiliate to match its employee donations, lira for lira. Many thanks to all who participated in the campaign! Al Younbouh Family & Supporters Walk for "Khotwe Btersoum Basme"
Community members, sponsors, donors, officials, humanitarian organizations, schools and clubs support Al Younbouh in the 2009 walk event. For the sixth consecutive year, Al Younbouh family organizes "Al Younbouh Walk", an event that gathers officials, colleagues from INDEVCO Group companies, representatives of the event’s corporate sponsors, donors, well known personalities, associations, schools and clubs supported Al Younbouh deserving human cause on Sunday, 3 May 2009 in the old souk of Jounieh. This year, more than 3000 people participated in this event. The Al Younbouh Walk features the slogan "Khotwe Btersoum Basme", which translates into "A Step that Draws a Smile". The walk is the annual main fundraising event to support the center. In addition, students look forward eagerly to this event and love to participate and socialize with all their friends. Likewise, it offers the opportunity to the participants to meet the students and learn more about the center and its mission. Al Younbouh is a non-residential rehabilitation center for mentally challenged young adults in Lebanon, which emphasizes quality of life and a spirit of humanity to assist integration into society. 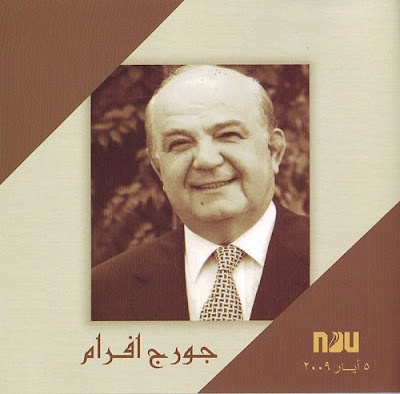 Al Forsan Al Arba3a, a Lebanese well-known band performed their famous songs. Throughout all the walk, Underground Fiesta, a young music band accompanied the participants with its festive rhythms. A pleasant community ambience of solidarity and entertainment throughout the stops overwhelmed the hearts and spirits of the young mentally disabled, the participants and Jounieh residents and inspired them for the next year's walk. SPARTANBURG, S.C. - (Business Wire) Exopack, an established leader in the development and manufacture of a variety of paper and plastic flexible packaging solutions, signed a joint venture agreement this week with Lebanon-based packaging manufacturer INDEVCO Group (INDEVCO) to manufacture co-extruded polyethylene film in the Middle East. Initially, this joint venture will include the installation of film production equipment in INDEVCO’s MASTERPAK sal flexible packaging facility in Zouk Mosbeh, Lebanon. This new extrusion capacity will be used for the manufacture of various coextruded film products for uses in flexible packaging. The film will be distributed by Exopack as part of the company’s family of film products. Exopack and INDEVCO have shared a long-term relationship through Exopack’s Global Packaging Linx (GPL) group. These two companies share common competencies in film production and flexible packaging manufacture to support customers from a global sourcing and innovation perspective. This joint venture represents the strengthening of this relationship and brings the first cost-effective films from the Middle East to customers in North America. This joint venture is the initial phase of a longer-term strategy to continue to build multiple film production sites in the Middle East. This will allow Exopack and INDEVCO to take advantage of the new polymer manufacturing capacity coming on stream in the Middle East in light of the increased economic advantage of ethylene production in this region of the world. Founded in 1955 by Georges N. Frem, INDEVCO Group is a privately-owned multinational group comprised of 50 manufacturing plants, industrial & commercial enterprises. The oldest and largest flexible packaging company in the Middle East, INDEVCO has a global production and distribution platform for its products and services, including nine manufacturing sites in North America. With 18 production facilities strategically positioned across North America and the United Kingdom, as well as a global network of alliance partners, Exopack is an established leader in the development, manufacture and sourcing of paper and plastic flexible packaging solutions and film coatings for a variety of consumer and industrial applications. 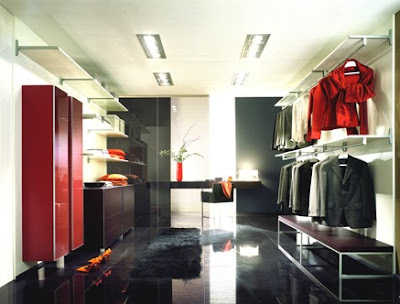 Exopack is an affiliated portfolio company of Sun Capital Partners, Inc. Brand Campaign - Fam Feminine Napkins 25 Year Celebration! Fam, leading feminine sanitary napkin brand in the Middle East, celebrates its 25 year anniversary and launches a TV campaign on major Middle Eastern channels. Fam sanitary towels are manufactured in National Paper Company Ltd., Napco Consumer Products Company, Napco Riyadh Paper Products Company Ltd. in Jeddah, Dammam and Riyadh, Saudi Arabia, as well as in Sanita sal, in Halat, Lebanon. The objective of Fam TV campaign "An3am Ref2it 3omr", which translates into "Softest life Companionship", is to celebrate the Fam's 25 year anniversary and to highlight Fam’s 25 years of cotton and comfort transmitted from generation to generation. The TV commercial consists the first stage of the celebration campaign and it will be followed by more events throughout the year. Source: United Corrstack Lauded for ‘Green’ Achievements, Board Converting News, p. 27, April 20, 2009. Reading, Pennsylvania based United Corrstack LLC (UCI) has been saluted by Ben Franklin Technology Partners of Northeastern Pennsylvania as the winner of its 2009 Northeastern Pennsylvania Innovation Awards in the category of manufacturing achievement. Awards went to companies or individuals that have achieved business success through the business development group’s funding and assistance, have helped others to achieve success, or have improved their business through innovation. United Corrstack, member of US based Interstate Resources, Inc., was saluted for its ‘green’ efforts, which include the production of recycled medium and its soon-to-be-completed Evergreen Community Power plant, which will use biomass organic waste for fuel. United Corrstack worked with Ben Franklin and Northampton Community College’s Electrotechnology Applications Center (ETAC), first to evaluate options to allow higher throughput at the facility and later to assess boiler fuel alternatives for UCI. Because of rising energy costs, United Corrstack is creating its own cogeneration plant, generated by materials such as wood and agricultural waste, to provide steam and electricity. At a time when recycling, renewable fuel, and energy independence are at the forefront of national consciousness, United Corrstack (UCI) is a model of green efforts. The company produces recycled corrugated fluting paper which is a component of cardboard boxes, and is in the process of developing its own power plant that burns biomass organic waste. UCI worked with Ben Franklin and Northampton Community College’s Electrotechnology Applications Center (ETAC), first to evaluate options to allow higher throughput at the facility, and later to assess boiler fuel alternatives for UCI. The winners will be honored on 12 May 2009 at the Zoellner Arts Center at Lehigh University in Bethlehem, Pennsylvania. United Corrstack produces recycled corrugated fluting paper, which is a component of cardboard boxes, and is in the process of developing its own power plant that burns biomass organic waste. The US manufacturer employs 80 people and, through the energy plant, expects to create 25 new positions.